The dresser is finished! That feels great to say since we didn’t think we’d be getting any furniture refinished and on the market with all these house projects. The pictures aren’t spectacular. I’m still lacking a decent photoshoot area but there it is. 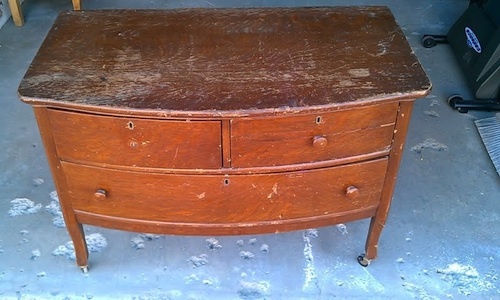 But back to this dresser. 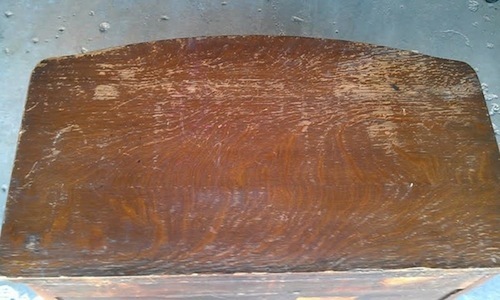 We’ve had it for a long time…when compared to the length of time we usually keep pieces we plan to refinish. It was one of the first we picked up (originally called ‘dresser 3’ back when I called them by the order we picked them up) and once lived in a barn. We used it to store our supplies in our workspace and avoided tackling it since the short, curvy piece had a lot of damage. 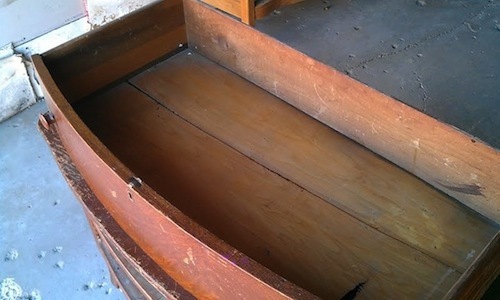 The bottom of 2 drawers had to be replaced and one entire drawer had to be put back together-glue and previous efforts to “fix” it had to be dealt with first…the dovetails were in rough shape. One drawer front was broken in half. With some wood glue, numerous coats of wood putty and lots of sanding, it’s at that point where you’d never know. 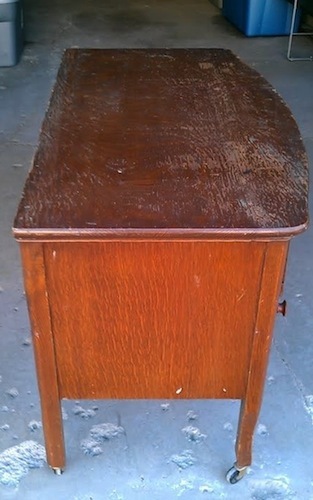 Can you tell which drawer front it was in the after photo? 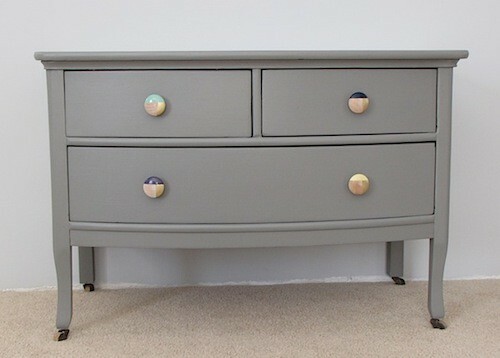 It came with rubber casters-not the originals-so I went into my collection of random bits left from previous furniture and found some wood casters which look much better and add height to this short chest of drawers. The hardware I made after I found similar knobs on etsy. Take a natural wood knob, spray a section with gold paint then add a color over a portion of the gold. 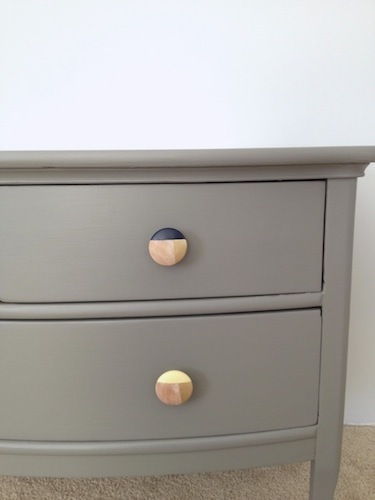 I had the navy, mint green, purple and yellow on hand and voila, a colorblock-like drawer pull. I know, it’s a dark warm gray. We do a lot of gray. We have had many orders for gray and we have been painting the rooms in our house various shades so we have mucho gray paint on hand. I loved this matte Benjamin Moore Chelsea gray in the second bedroom and wanted to see it on this piece…after I had painted it a “custom” color (we mixed a bunch of the gray samples together to try to get rid of the stuff) but that wasn’t quite what I had pictured with the hardware. The paint is matte and the finish coats of poly are matte. I think it’s pretty adorable. You can find it in our etsy shop and if you are in the Minneapolis area or close to southern Minnesota you can take this cuteness home. 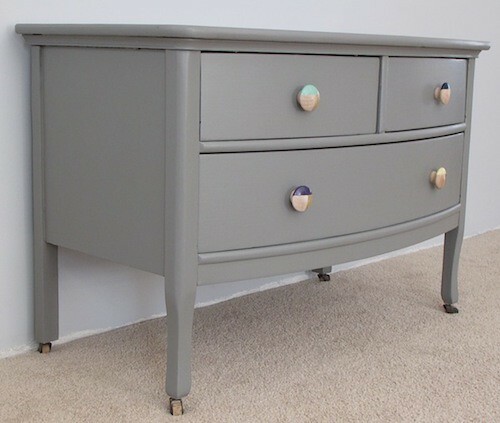 This entry was posted in Before and After, Benjamin Moore Paint, Dressers and tagged antique dresser, before and after, Benjamin Moore Chelsea gray, chelsea gray, furniture, hand painted, handpainted, paint, refinish, reveal, salvage, upcycle. Bookmark the permalink.